The Lira was holding on to its rebound gains after 6,100 investors reportedly listened in to Turkish FimMin's conference call. But then Mohamed El-Erian, chief economic adviser to Allianz SE, spoiled the party by telling Bloomberg TV that it's time to reduce Turkish exposure as restrictions on shorting the lira only offer short-term relief. "Turkey is trying to rewrite the crisis management chapter in the playbook for emerging markets. It’s trying to go without interest rate hikes. It’s trying to do it without the IMF. That’s hard. It’s not impossible, but it’s hard." Additionally, El-Erian warned that the $15 billion pledge from Qatar "not enough," adding that the lira is "as uncertain as starting quarterback spot on New York Jets." "We are in the midst of a contagion phase that’s impacting both strong and vulnerable economies." "If I were back in the game, I would say this is great. The market isn’t distinguishing enough between strong and weak names." El-Erian concludes by telling investors to look for three things: balance sheet strength, agility (policy and corporate side) and places with no immediate funding needs. This seemed to spark an immediate reversal in the lira...admittedly modest for now. 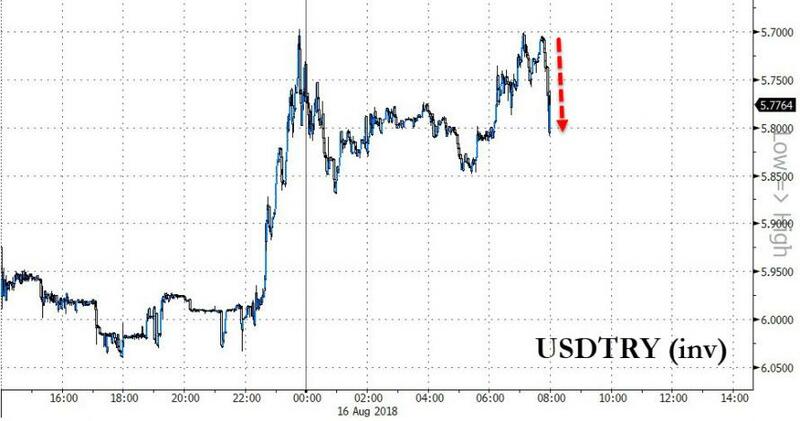 Julian Rimmer, a London-based trader at Investec Bank, said "I definitely wasn’t impressed," in response to Turkish Finance Minister Berat Albayrak’s conference call with investors on Thursday. “Unfortunately, he still seems to be claiming that this crisis is purely caused by a change in investor sentiment because of some geopolitical events. But this dispute with America only began recently. And the Turkish lira has lost a huge amount of its value in the last five years." “He was asked a very straightforward question on monetary policy. It was an easy time to say that they would raise rates if necessary. He ducked the question." “There’s denial and a refusal to accept market realities and the fact they will have to hike rates and/or cut spending very sharply. There’s no way of getting round it. It seems like they think they can." 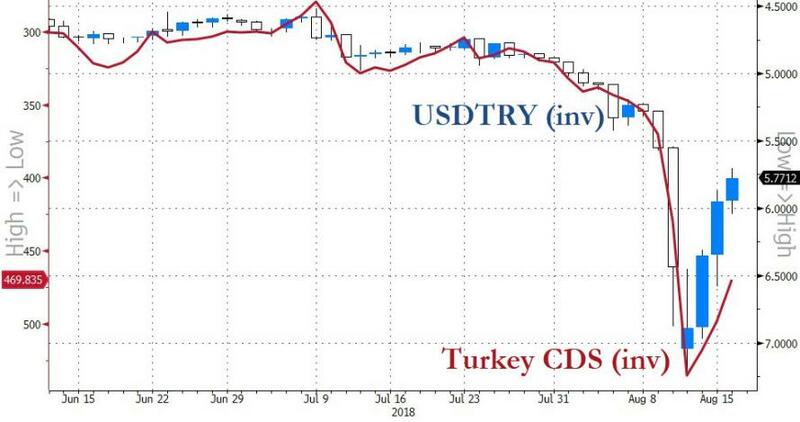 "Turkey may be able to avoid a full-blown balance of payments and banking crisis for another 3–6 months by tinkering with reserve requirements and other temporary regulatory changes," Hammarlund writes. "But the day when the authorities will be forced to change course is drawing closer"
The credit market - not subject to same technical squeeze that FX is - is not buying the bounce.